When learning Spanish pronunciation can be a struggle to get your tongue around right? You're probably focusing your time and energy on learning to roll your “r” sound or getting your “ll” just right. And while that's not a bad way to spend your time, you might be overlooking a subtle yet crucial pronunciation distinction. and even understand some crazy misspellings you'll see online! That's why today's post is all about Spanish B/V pronunciation. 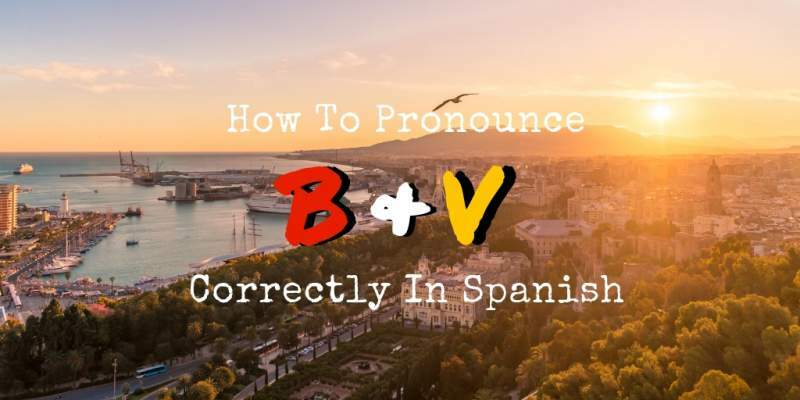 You'll learn about the differences and similarities between the letters B and V in Spanish, so can finally stop feeling confused about how they sound! I've made a video for our Fluent Spanish Academy YouTube channel all about B/V pronunciation which you can watch below. Alternatively, scroll down to read the full article. By the time you finish reading, you'll know exactly how to pronounce these letters correctly in Spanish and sound more natural when you speak. 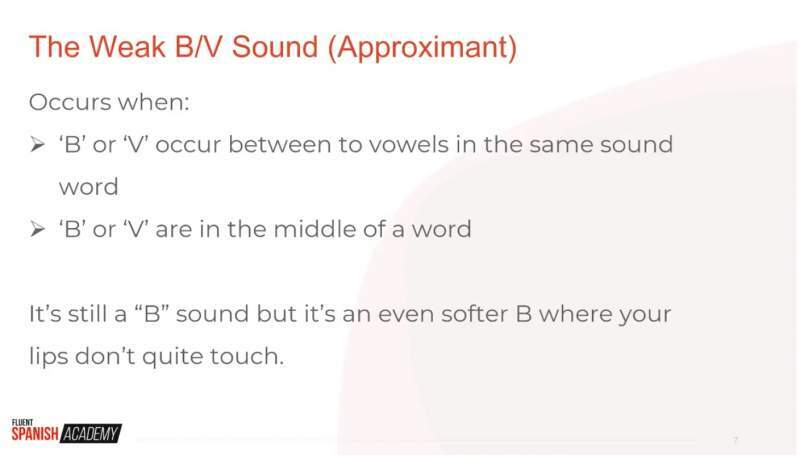 ‘B' & ‘V' Have Different Sounds? True or false? 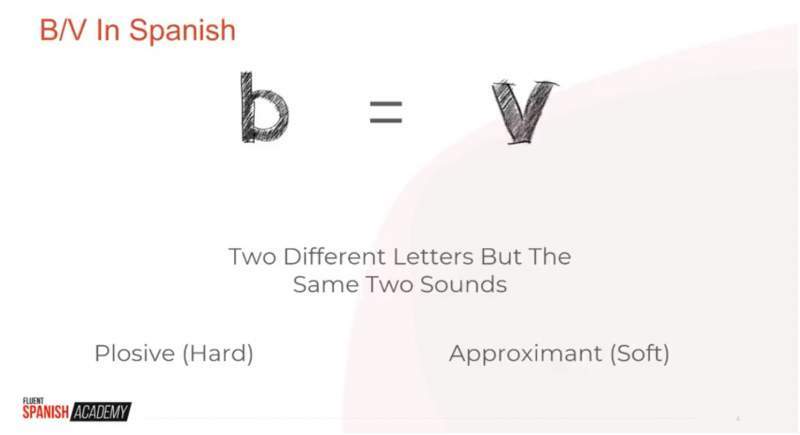 The letters B and V sound the same in Spanish. B and V do have the same sound in Spanish. But what you might not realise is that there are actually two different sounds Spanish speakers make when they pronounce a B or V depending on the word and context. Don't worry about the linguistic terminology too much. You can simply think of them as the hard and soft B/V sounds respectively. The difference is less in the letter being pronounced and more in how you use your mouth…specifically, your lips. When B or V appears at the beginning of a word in Spanish, it makes a “hard” (plosive) sound. This sound is very similar to the sound B makes in English, although it is just a little gentler. It's made by pressing your lips together, then opening them and releasing the air. When you pronounce any of these words, you'll make the same sound as you would pronouncing B in English, but without blurting it out quite so strongly. When a B or V appears in the middle of two vowels in the middle of a word, it makes a “soft” (approximant) sound. Again, this sound is very similar to the sound B makes in English, but with even less force. In fact, your lips should barely touch (or not even touch at all) right before moving on to the next sound in the word. The softer pronunciation is also sometimes called the “lazy B/V” because it takes less effort to make than a hard B/V. Now that you know the basics of pronouncing B and V in Spanish, it's time to build your fluency with these fun practice ideas. Pay close attention to the sounds you hear when speaking and listening to native Spanish speakers. 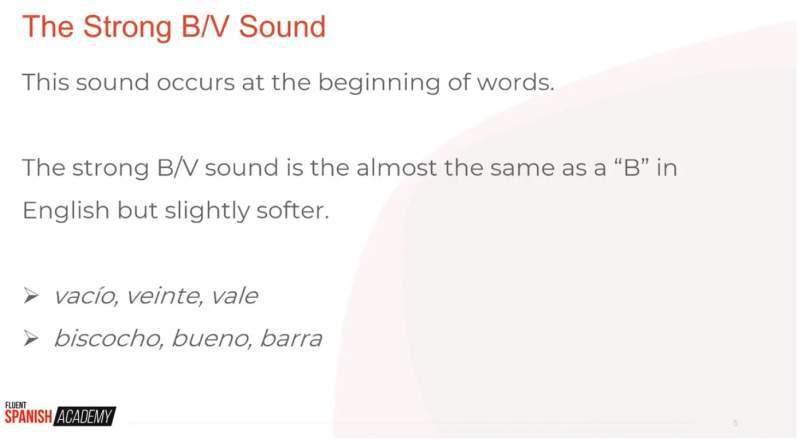 Once you're paying attention, you'll easily pick up on the gentle way Spanish speakers pronounce B and V.
If you aren't already using audio in your language learning, I highly recommend it. Look for natural audio and captivating stories to supplement your other learning resources. It may be tempting to listen to audio at a slower speed than normal while you're still learning the language. But it's a major mistake to slow things down. How often have you tried to listen to something in Spanish and just can't keep up with the pace of the speech? That's because you haven't learned to follow along at full speed. Instead of slowing down what you listen to, you need more practice listening to natural speech the way it is spoken in real- life situations. As you do so, listen carefully for the B and V sounds and notice how they're pronounced in different words. In addition to listening to holding lots of conversations, listening to short stories in Spanish can be a great way to improve your listening skills and get to grips with the Spanish B/V sounds. 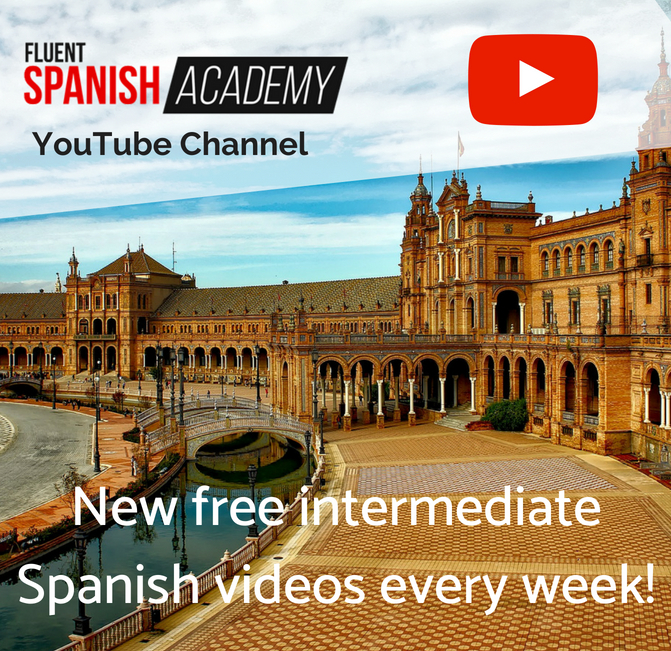 The video below features a short story taken from the Fluent Spanish Academy. Why not listen to the story and tune your ear to the Spanish B/V sounds as you do so? There's nothing quite like hearing a sound when you're trying to make it yourself. That's why my first tip was to start by listening! But, in addition to listening to as much Spanish audio and conversation as you can, try using a specific video tutorials, such as the one I included at the top of this post, to guide you through the hard and soft B/V sounds. The last few minutes of that video are dedicated specifically to guided practice where you can say the B/V sounds along with me. If you're struggling to master the Spanish B/V pronunciation, it's worth bookmarking the video so you can come back and repeat this practice exercise regularly. In time, the sounds will become much more natural to you. You'll also find more specific information in the video about how and when to use the plosive (hard) and approximant (soft) sounds like a native Spanish speaker in no time. Click here to go back and watch the video now. When you make the hard B/V sound, your lips will close before you pronounce the letter, as you would in English. All you need to do is work on softening the pronunciation slightly. With the soft B/V sound, on the other hand, your lips don't close all the way. If they do, they should barely touch right at the end of the letter. Try to pronounce the B/V softly, by just barely touching your lips together when either letter appears between two vowels in the middle of a word. Do you remember seeing how fast you could repeat tongue twisters as a child? Turns out, tongue twisters are more than just fun for children! Believe it or not, Spanish tongue twisters (trabalenguas) are a fun and challenging way to perfect your pronunciation and gain confidence with B and V.
Your pronunciation and fluency will get better as you get practice repeating the B and V sounds regularly with fast, repetitive phrases. Start slowly with each trabalengua, focusing on pronouncing each word individually. As you feel more control over the silly phrases, you can speak a little faster each time through. With a little practice, you'll find the two different B and V sounds soon start to flow quite naturally! You'll be able to decipher common spelling errors in text messages and online. Mis-pronouncing the Spanish B/V sound, especially in the middle of words, is a surefire way to get yourself identified as an English speaker. 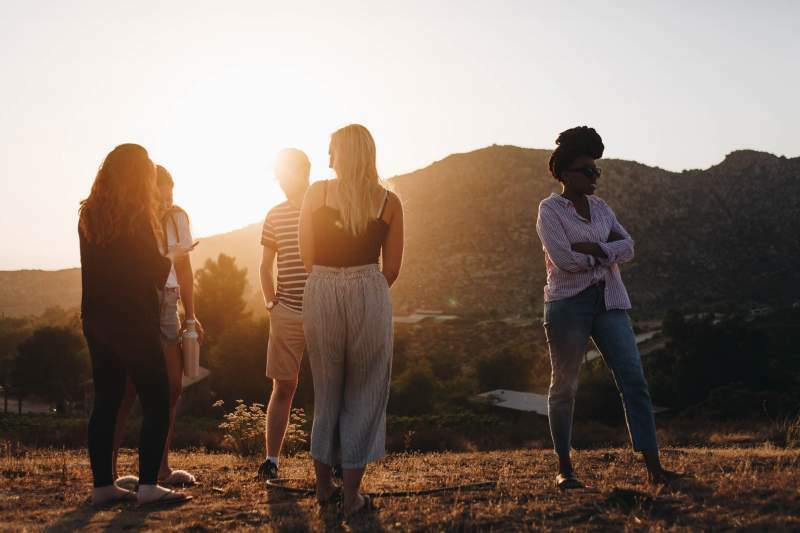 Although having an accent is nothing to be ashamed of while you are learning a new language, it's always nice to sound as much like a native speaker as possible. It helps other people understand you better and is immensely satisfying to see their surprise when they find out where you're actually from. The more you hear and use B and V correctly in Spanish, the more normal these sounds will seem. You'll be confused less often about what is being said once you're familiar with the way B and V are actually pronounced in Spanish. As you gain confidence with the B/V sound, not only will it be easier for others to understand you, you'll also find it easier to recognise what native speakers say to you as well. Any word with a B or V is a likely candidate for misspelling, but estar and andar are especially tricky for one reason: each verb has common conjugations that use both B and V.
Estuve and estaba are both correct. So are anduvieron and andaban. The fact that some conjugations use B, while others use V leads to some common spelling mistakes, even for native speakers. In the case of a word like vaya, the misspelling is twice as confusing because baya is an actual word in Spanish! Context should tell you if someone means “berry” (baya) or the first person subjunctive of “to go” (vaya). But mixing up the two words can still be confusing if you are already struggling to keep up in a conversation. So now you know that Spanish B/V are the same… but subtly different. Remember, it's not which letter that's used that matters—the letters B and V are effectively the same in Spanish. It's the position of the letter in the word that determines whether you should use the plosive (“hard”) or approximant (“soft”) sound. The differences are subtle, but you can learn to recognise and pronounce both sounds B and V make in Spanish with practice and by paying close attention when listening. 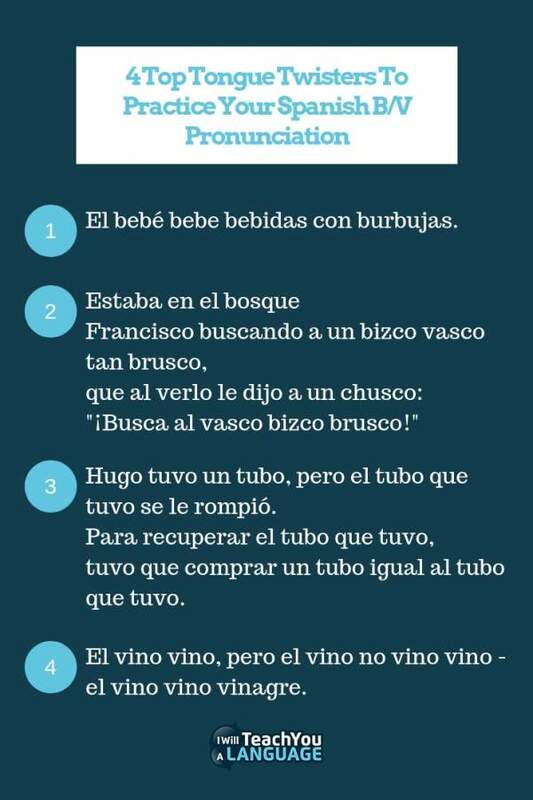 Keep at it and before you know it, you'll be pronouncing the Spanish B/V sounds like a native! Did you realise that the Spanish B/V sound difference was so important? Which technique or techniques from the post are you going to use to master these sounds? Leave me a comment below and let me know!